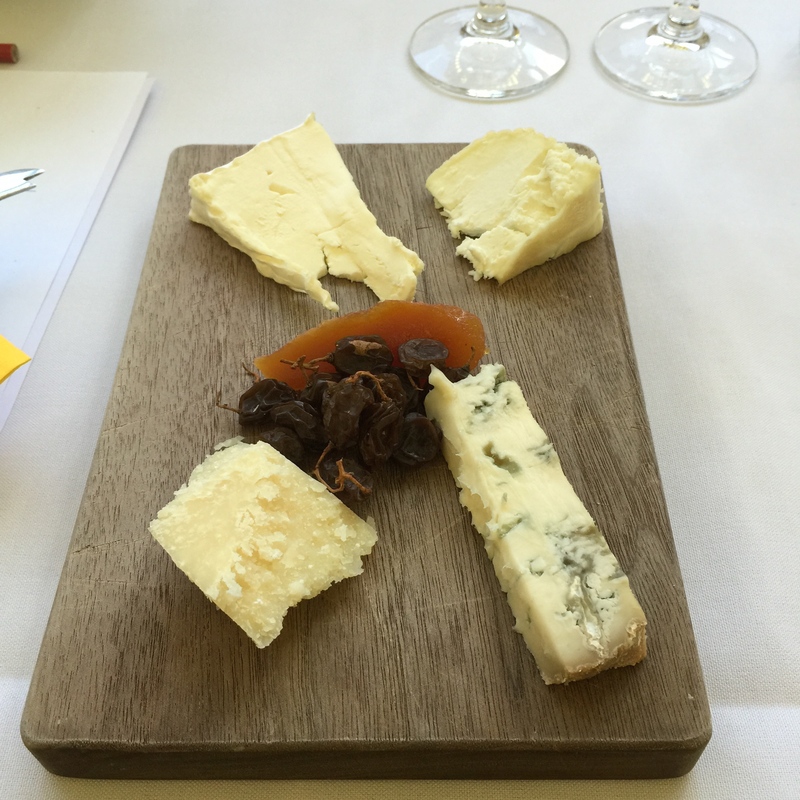 Four of the cheeses tasted with some quince paste and dried sultanas to accompany. A few weeks ago my friend Kat sent me a spreadsheet listing the dates of a number of cheese masterclasses run by the iconic Smelly Cheese Shop at the Adelaide Central Market . With Kat’s birthday imminent and she being a fellow cheese-lover, we had a quick email exchange whereby she nominated a few dates she could be available. We agreed on the first in the 2015 series called Cheese and Sparkling Wine Pairing with the Italian Cheese and Wine Pairing class later in the year as a backup should this class be full. As it turned out, the first choice was available and we toddled off on a hot summer evening to taste some delicious and refreshing sparkling wines from France, Italy and Australia with some familiar cheeses and a few that were totally new to us. Our host for the evening was Valerie, one of the original founders of The Smelly Cheese Shop who is also a Frenchwoman from Normandy (home to Camembert cheese). Valerie gave us a tour of one of the three specially designed cheese rooms on the ground floor of the company offices, just a street away from the Adelaide Central Market. In the hard cheese room we learned about the ageing process of different cheeses and were told some seriously scientific terms about the moulds and bacteria that create the flavours distinctive to the different cheeses. The cheese room was a chilly 12 degrees celsius so we were glad to head upstairs to the tasting area. What awaited us were two beautifully set tables with a board of cheese for each person, some tasting glasses, water, plus a an extra round of cheese for each table. The Brillat-Savarin was paired with an exquisite sparkling Burgundian Chardonnay called Cremant de Bourgogne Blanc de Blanc NV (Non Vintage) by the Andre Delorme estate. This was a brilliant pairing with the triple creaminess of the cheese just cut by the fine bubble of the wine. The wine itself has an elegant, not-too-sharp finish. Our next pairing was an elegant goat’s milk cheese called Vermont Coupole, made by the Vermont Creamery in the US state of Vermont, alongside a local Adelaide Hills sparkling wine called Ngeringa Eclat NV from Ngeringa Vineyards. This pairing was spot on for me as the slight tartness of the goat cheese went well with this sparkling Chardonnay/Pinot Noir. We were told that the wine was made in the ‘no dosage’ style, meaning that no extra sugar was added after the disgorging and before the final corkage. This makes for a less sweet sparkling wine and was, in my opinion, a great choice for the Vermont Coupole. Pairing number three saw a washed rind cows milk cheese from Champagne-Ardenne in France married with a French Champagne called Billecart-Salmon Brut Reserve NV. The cheese was a Langres AOP* in its own little box and had a sort of well in the middle that comes from it not being turned as are most cheeses during the ageing process. The well served a purpose. Valerie had us poke a few holes in the top of a round of the Langres and pour a bit of the champagne on top. As it absorbed into the cheese we were instructed to add another dose. We then passed the cheese around and took a generous dollop each onto our plates. The Langres, even after being doused with champagne, had a smooth and creamy yet firm texture that was a fine match with the elegant restraint of the tight-bubbled Billecart-Salmon. Flavour-wise, this cheese and the champagne were somewhat mild and a good middle point for my excited palette! Our fourth cheese and bubbly pair was a Parmigiano Reggiano DOP** and a very refined lady called Eliza. Many folks use Parmigiano only for cooking but this crumbly, nutty gem deserves to stand alone. Just break off a chunk and eat it! The Padthaway “Eliza’ Late Tirage 2002 sparkling wine from the Padthaway region in South Australia had a lovely lemony nose and mineral finish that well complemented this gift from Emilia-Romagna in northern Italy. Cheese number five was a Gorgonzola Dolce DOP** from Piedmont in northwestern Italy; a classic blue that even non-blue cheese eaters would have to love. The ‘dolce’ in its name comes from the sweet creamy texture. Punctuated with the slight tang and saltiness of the blue mould, this beauty was paired with a Guerreri Rizzardi Extra Brut NV Prosecco from the Veneto region of Italy. This was no sweet, cheap and cheerful fizz. The Guerreri Rizzardi had a slight just-ripe pear overtone that was a welcome addition to the evening, freshening the palate after the last two salty cheeses. I loved every moment of this pairing. In fact, I loved every moment of this evening. I met other ‘cheesophiles’, got to hang out for a few hours in the presence of passionate food and wine experts and discovered some new and interesting taste sensations. Now where is that booking sheet for the next masterclass…? To find out more about The Smelly Cheese Shop, their cheese club and their Masterclasses, visit the links in the first paragraph of this post. Next Post Tasmania – Devilishly good!